Today was ex #1’s last day in town. My babies cried themselves to sleep because he leaves for 28 days to go to work. He did a few things to try and make it better for them. He wrote the number of days left on the days of the calendar in the kitchen; both babies know how to read the calendar and do it quite frequently. He wrote 2 letters to each baby – one for tomorrow and a duplicate in case the first one gets accidentally destroyed by little hands. We also prayed for daddy before he left. Gave him a safe journey prayer and, in the words of the 5 year old, “… and if he should fall off a cliff, help him back up the cliff so he can come home in 28 days.” I told the Caiden that God hears the words of a baby much clearer than any adult and he was happy about that. His request got written in “the book” of prayers first – before mommy’s! I am sad at his leaving as well. He has been a great help to me in many areas, during this trying time in my personal life. This morning, I made quiche. That was fun! And, it’s so simple, I can’t believe I haven’t tried it before. 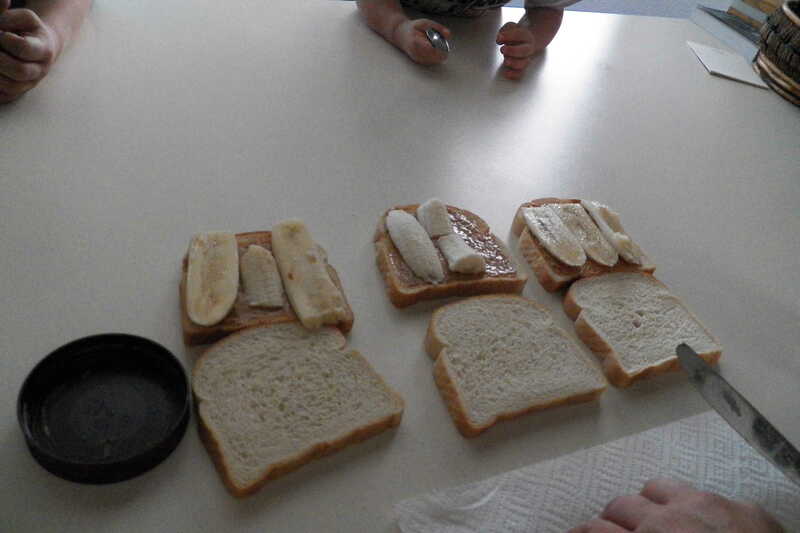 For lunch, I made Peanut Butter and Banana sandwiches for the babies. 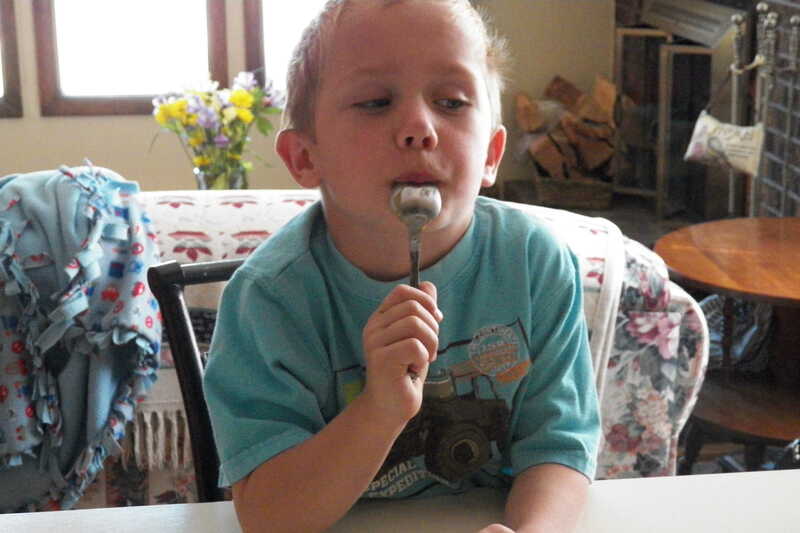 The babies had peanut butter on a spoon while they waited for their lunch. It was so cute, watching them wait for me! They are darlings and they ate lunch without a blink. It was gone so fast! 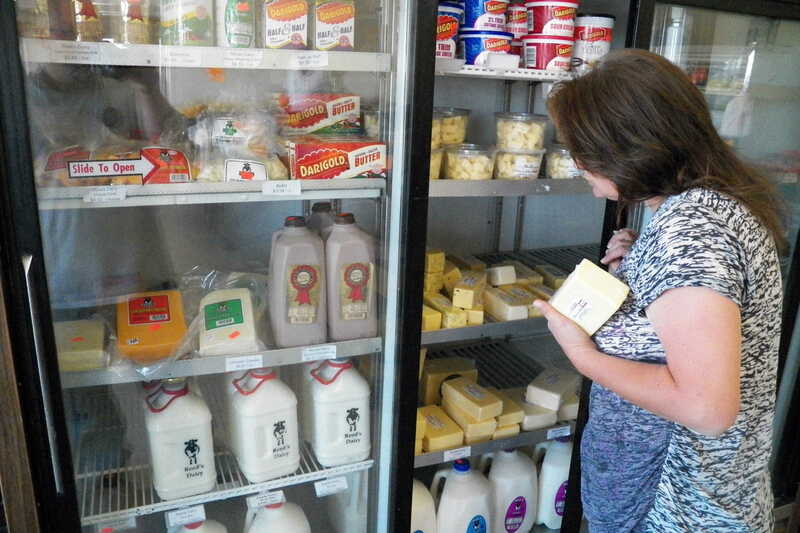 I went to Scorsby’s to look for some fresh fruits and vegetables. I am trying to find a decent market to get such things and not a supermarket like Alberston’s. I had some fun and found some good foods. Especially cherries. I’m not talking canned or in bottles. I’m talking, still on the branch/stick/vine they grow on! Oh, and they are delicious! I fed some to my boys and they are now in love with cherries. They have decided to save all the pits so we can try and grow a cherry tree in our back yard. I took the pits out of many cherries to make a Cherry Crisp, like I’ve done with blueberries, blackberries and peaches. It was delicious! 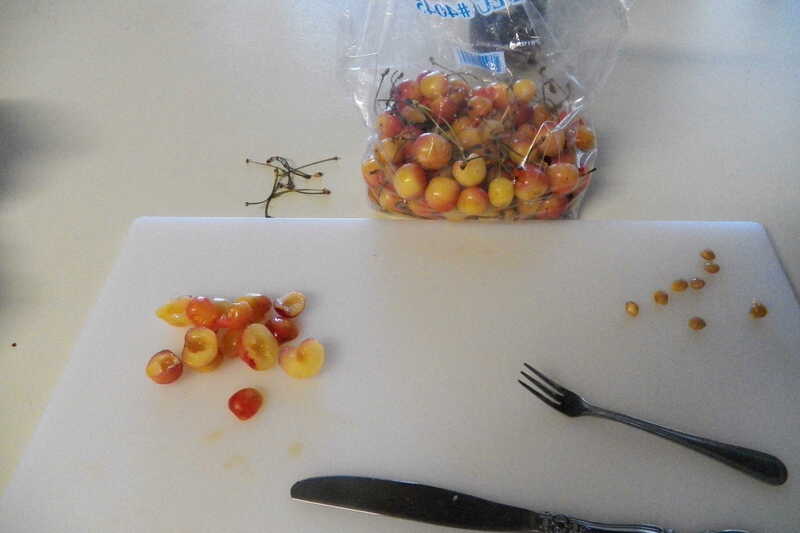 The cherries really set off the whole things. More so than the other fruits I’ve made it with! Tonight’s dinner was at the request of ex #1. He wanted my homemade chili and I made it in a cast iron skillet and topped it with locally made cheddar cheese. It was very good but I did not keep it hot enough for when it got to the table. I’ll have to work on that one. We are finally out of the fresh peas that I got at the Farmer’s Market. We’ve been having them with every dinner since Saturday. 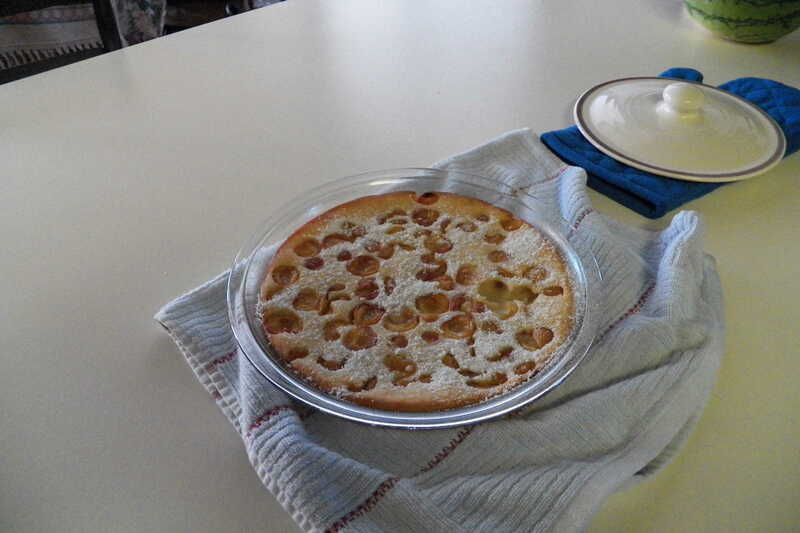 They were very good and I did not cook them, preferring them cold. 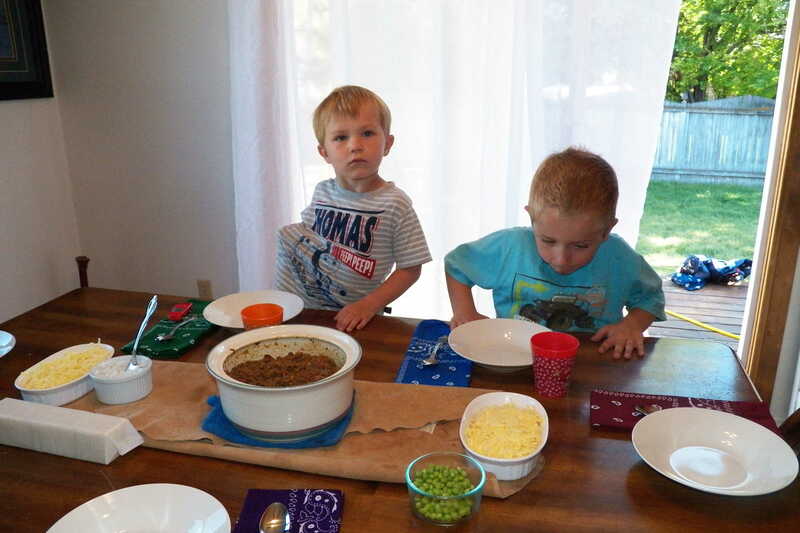 Even my boys liked them! I did not have the energy to make a salad, tonight. I have not been taking naps during the day and have ended up very tired at night. However, I am getting up at 6:30 very easily! I am sure tomorrow I will be tired as all get out. It’s after midnight and I’m still up, typing away instead of sleeping. I wanted to settle my thoughts before going to sleep. With daddy leaving and the nanny out of town for the holidays, it will be just my boys and I tomorrow. She should be back at some point on Thursday. The boys and I will do fine alone – but being tired doesn’t help! I enjoyed ex #1’s presence around the house these last two weeks. He was a strong role model for the boys during their transition and they saw a lot more of him this time than every before, since taking this job in ’08. I see the influence and it is wonderful! Not to mention, he was a great help to me – and not just as a man around the house taking care of things that I can’t do for myself. 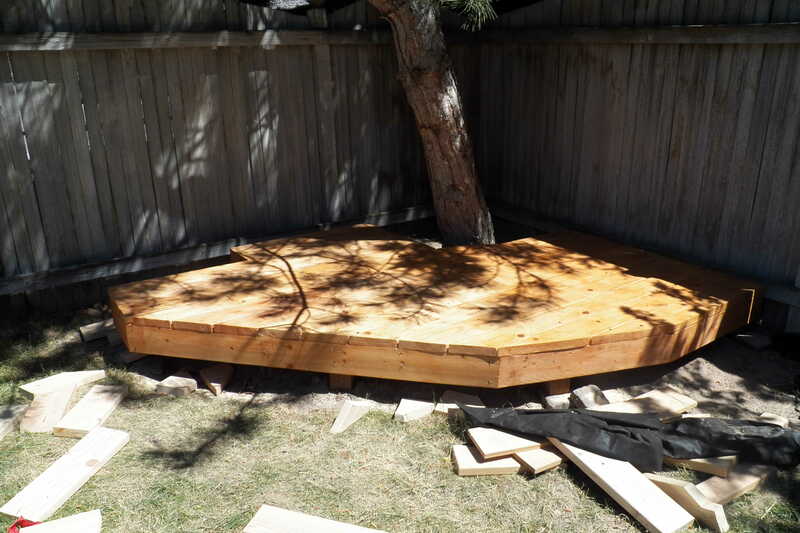 One of the things he did for me and mine was finish the mini-deck out back. I can now put my Bistro table out there and enjoy the mornings in Idaho in the shade of a pine tree. Nothing else will grow under there, so the deck was a great idea! At the time this picture was taken, the deck was complete. Clean up and a last stain were all that was left. Tomorrow, I will take a picture to show you what we did with the stones we had originally bought to use as a mini-deck. The small cut-away piece you see on the left of the picture is where I plan to plant a bush or small tree – one that will be ok with being near a pine. Not much will survive over there. Just out of curiosity, do y’all have any ideas on what will grow nicely near a pine? The boys will be sad tomorrow; however, as a mother, it is my duty to smooth the rough edges they can’t smooth for themselves. I’m sure we’ll find something to do to keep us occupied and not thinking about those 28 days. 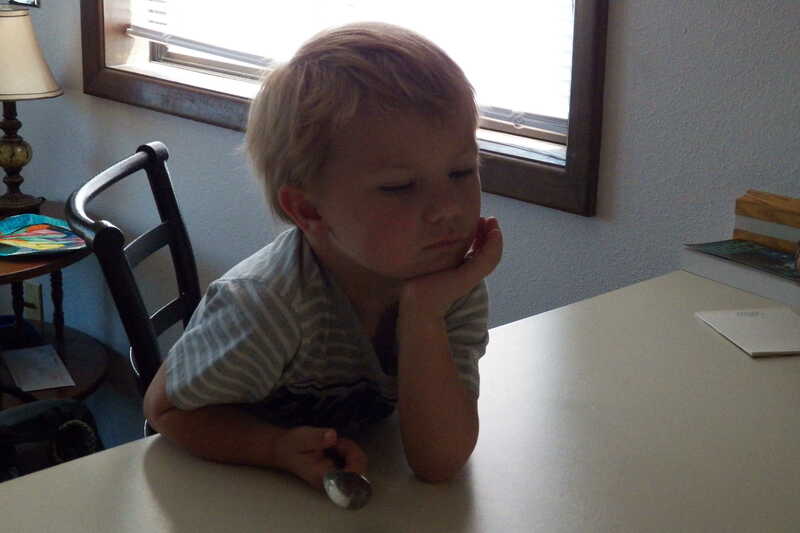 I asked my oldest, Caiden, if he wanted to go with a friend to a 4th of July breakfast and he said, “No. I want to stay home with you. You cook good breakfasts.” I will smile all the way to sleep over that comment! Two months ago, a month ago, 2 weeks ago, he never would have said that. Oh, did you see my summer hair style? I figure it’ll be cooler for the hot months of Idaho. Let me know what you think about that short puff of hair I have left!